Scroll down for complete descriptions of each workshop. A BIPOC (Black, Indigenous, People of Colour) priority* workshop where we will be preparing a Filipino dish called Ginataang Bilo Bilo (Sticky Rice Balls in Coconut milk). This dish is usually made together, getting all the Titas (aunts) and kids to participate in rolling the rice balls into circles. There is a community gathering aspect and conversation about the importance of food from home, how food is not only a memory but a living remix. The original recipe is the same but the ingredients have to change with what is available. That is a form of evolution, and that is how these recipes live on through the diasporic communities. *This workshop is open to all and at the same time, we are prioritizing Black, Indigenous, People of Colour (BIPOC) participants. PRESENTER BIO: Deann Louise C. Nardo is a Pilipinx non-binary femme poet and artist living, working, and napping in Tiohtiá:ke/Montréal. A voracious craft pursuer and maker, they work with wood, paper, food and whatever else you can throw at them. Their work thrives on the thin line where questions live; where memory, healing, and community are embodied. You can find them bobbing their head to lo-fi Hip Hop and leaving pavlovas as calling cards at potlucks. Caribbean cooking is more than a bunch of ingredients lumped together. It is centuries of cultivation beyond eurocentric taste. It is our elders yelling from across the room to come and eat. It is the cookouts we might be late for, but never miss. It is seasoned diasporic love. Recipe print-outs will be provided. Facilitator bio: Noka Palm Trees is a multidisciplinary artist who showcases their eccentricity through visual, poetic and performance art. Their known for mixing Afro-futurism, Jamaican pinnacles, and a funkadelic aesthetic across all forms of their own artistic style. This workshop outlines some go-to plant allies in times of burnout and persistant fatigue. We will experiment with different types of plant preparations including an infusion, a decoction, a tincture, and flower essences. Facilitator bio: Milena is a queer witch herbalist with lots of feelings. Their approach to plant medicine is intuitive, magical, tactile (lifelong gardener, cook and potion-maker), evidence-based (in their 2nd year of plant medicine therapy/naturopath studies), informed by their experience of chronic health issues and based in social and environmental justice. Plant friends have helped her to make peace with her body, mind and spirit, reconnect to the Earth and ground herself; they hope they can inspire others to do the same. All events take place on the traditional territory of the Kanien'kehá:ka. The island called “Montreal” is known as Tiotia:ke in the language of the Kanien'kehá:ka, and it has historically been a meeting place for other Indigenous nations, including the omàmiwininì or Algonquin people. As an organization that centers social and environmental justice, we feel it’s crucial to be informed on the past and ongoing consequences of colonialism. We encourage everyone to learn about the history of these lands and to support Indigenous resistance here and across Turtle Island. ❤ Whisper translation and child care are available for all events with 48 hours notice at midnightkitchencollective@gmail.com. ❤ A vegan, nut-free meal will be served at all events. Please bring your tupperware and utensils! ❤ We ask people attending our events to not wear strongly scented products (perfume, cologne, hair products, lotions etc), however we can not guarantee a scent-free space due to other individuals and groups in the building. Join us for a free dinner and keynote featuring special guest Leah Penniman of Soul Fire Farm, author of the newly released book "Farming While Black." Books will be available for sale by Racines. Some of our most cherished sustainable farming practices––from organic agriculture to the farm cooperative and community supported agriculture (CSA)––have roots in African wisdom. Yet, discrimination and violence against African-American farmers has led to a decline from 14 percent of all growers in 1920 to less than 2 percent today, with a corresponding loss of over 14 million acres of land. Further, black communities suffer disproportionately from illnesses related to lack of access to fresh food and healthy natural ecosystems. Soul Fire Farm is committed to ending racism and injustice in our food system. Through programs such as the Black-Latinx Farmers Immersion, a sliding-scale farmshare CSA, and Youth Food Justice leadership training, Soul Fire Farm is part of a global network of farmers working to increase farmland stewardship by people of color, restore Afro-indigenous farming practices, and end food apartheid. And now, with the new book Farming While Black, Soul Fire Farm extends that work by offering the first comprehensive manual for African-heritage people ready to reclaim our rightful place of dignified agency in the food system. Join us to learn how you too can be part of the movement for food sovereignty and help build a food system based on justice, dignity, and abundance for all members of our community. AUTHOR BIO: Leah Penniman is a Black Kreyol educator, farmer, author, and food justice activist who has been tending the soil for twenty years and organizing for an anti-racist food system for fifteen years. She currently serves as founding co-executive director of Soul Fire Farm in Grafton, New York, a people-of-color led project that works to dismantle racism in the food system. She has been recognized by the Soros Equality Fellowship, NYSHealth Emerging Innovator Awards, and Fulbright Distinguished Awards, among others. For some, going “home" for the holidays can be a big stressor. If you feel any anxiety, fear or concern around the holiday season- we at Midnight Kitchen would like to invite you to a dinner in support and celebration of you in all your fabulousness! 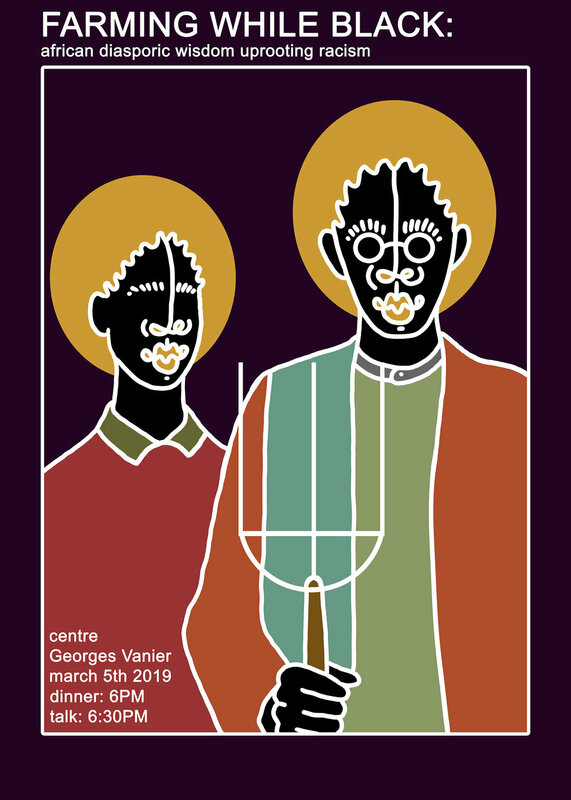 This event was created with racialized students and those whose families do not accept their sexuality, gender identity or expression in mind, but we welcome anyone who feels they need some support! We will offer a delicious dinner, a couple of chill activities, and potentially some take home surprises. Participation is capped at 20 and there is a link for registration on our Facebook event, or email us for more info. If you change your mind about attending please cancel your registration so there's room for someone else. 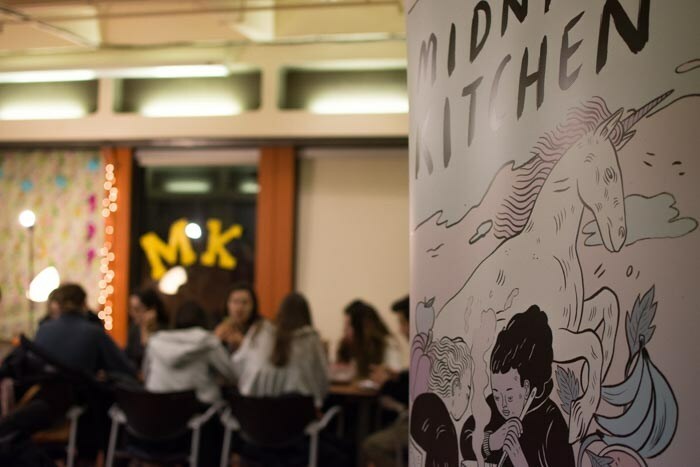 Ever wonder about the history of Midnight Kitchen and Food Politics on Campus? Come eat lunch with us and get to know us a bit better! -& Personal opportunities for involvement in the city. 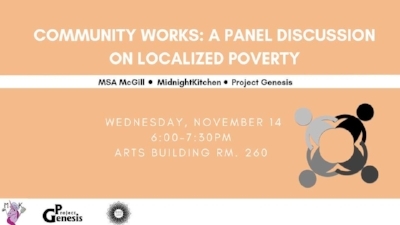 MSA McGill Presents a Panel Discussion on localized poverty. In collaborations with Project Genesis, Midnight Kitchen and The Canadian Council of Muslim Women (CCMW). Join us for an informal panel discussion to explore the work that is being done by the participating community based organizations (described below), and take part in an engaging dialogue addressing topics relating to local poverty, food justice, social housing, marginalization and more. And learn about how you can get involved within your local community! 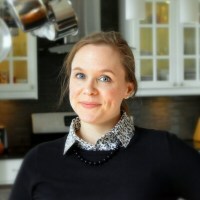 Lisa is an intuitive & mindful eating expert, weight inclusive & non-diet dietitian. She helps people reignite their relationship with food and their body. Giving hope that there are solutions to your food and health worries is her passion. She works with people who are struggling to ditch diets, feel better in their body and rediscover joy & peace with food and eating. She blogs, counsels people virtually and in-person as well as shares her non-traditional (radical?) nutrition and food view with the media to give diet culture a run for it’s money! She is an intuitive eating expert, weight neutral & non-diet dietitian and truly believes that all foods fit into a healthy and happy lifestyle. She has unique personal experiences that help her understand the struggles we face with dieting and changing our food habits. This event is happening on October 12, 2018: please RSVP on Facebook! Our first workshop of the semester! This workshop will be preceded by a tour of our garden and some harvesting. Lunch will be served. In this workshop, participants will learn about different methods for making herbal preparations. We will cover herbal infusions, decoctions, infused oils, salves & balms, tinctures & vinegars, hydrosols, and best practices. This workshop is aimed at beginners and intermediates (who are looking to troubleshoot & discover how another kitchen herbalist crafts). Participants will get a zine to take home as well as herbal preparations made during the workshop. Pamela is a disabled queer settler, artist, activist, crafter, keen fermenter, community organizer, and sometimes scholar. The kitchen and working with and around food is what Pamela considers her hearth. Her project, Blueberryjams , offers a variety of crafted products, penned texts, and skillshares with a focus on DIY, radical home economics, and herbalism through an emphasis on sustainability, creativity, and community. Everything made by hand, with heart.